On Dec. 5th the Fauquier wrestling traveled to Skyline HS. for the Elite Opener, a 12 team tournament for the Falcons’s first season event. With four placers the team finishes in 5th place with 287 points. This season opener sometimes comes with new experiences, hidden talent and unforgettable matches. This event was pretty special as each weight class supported top ranked wrestlers. Factoring in the six top teams from Virginia and throw in the number one rank team from Maryland - Good Counsel you have grounds to call this the toughest December tournament in the state – or the entire season. This could be debated, but I will believe it is. The fight and sacrifices to win those close early season matches does comes with suffering losses for some but earning the bonus points achievement wins by pin helps out great and is one the factors that aided in Fauquier success in the early opening rounds. They only can crown one Elite Opener Champion per weight class as Fauquier Senior classmen 170 lbs Garrett Tingen and 182 lbs Clifford Harrison both wore there first place metals around neck after meet concluded. This would also mark the third time Tingen had earned champion of the Elite Opener winning it last year and his sophomore year as well. As Fauquier finished 3rd the past two seasons this Saturday Falcons did find itself bouncing within the top three of the field of 12 teams. As Coach Doug Fisher gets this year teams ready for the 2015-16 campaign - look for adjustments in the line-up as the season progresses forward. Garrett Tingen went 5-0 earning three pins one technical fall and a forfeit through his five matches. No questions with his performance as he looks to be on track and his senior leadership is showing. Clifford Harrison also went 5-0 and had two pins a forfeit and two decisions. His third win and impressive victory came with a 3-2 decision over Erik Eva from Christiansburg. Along with Tingen and Harrison sophomore 113 lbs Kyle Budd also won his opening three rounds and advanced to the Championship pool as well. Budd had two pins and a forfeit but fell short with two losses in the Finals to take a third place. This was the first time that Kyle Budd has made it to the Elite Opener Finals and posting a 3-2 record. Other standouts and medalist came from senior 220 lbs Thomas Palmer who also posted a 3-2 record as well. Palmer earned three pins on his way to a third place finish. For other wrestlers posted a 3-2 records were 132 Ty Foster, 138 Kyle Roche, 152 Caleb Strum, and 160 Franco Camarca. Q: Having two champions last year, three the year before how does it feel to continue to have Elite Opener Champions? Fisher - "I think it demonstrates that we continue to provide an environment for wrestlers to maximize their potential. Not only did those two compete well and walk away with a gold medal, they did it at two weight classes higher than they were last year which adds significantly to the challenge." Q: Can you express the toughest of the Elite Opener this year verse past? Fisher - "The year field seemed to be loaded with ranked teams. The Elite Opener continues to get tougher and tougher every year. I feel as though this year we were as competitive as last year, but with the addition of Good Counsel, MD, and an improved and impressive Battlefield team, the competition this year increased substantially." 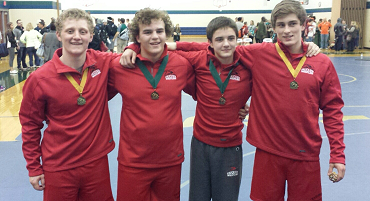 Q: Six Falcon wrestlers posted a 3-2 record - any concerns or area of improvements with the core of these starters? Few of them could have squeaked a 4-1 record – with some close matches. Fisher - "Agreed, most of those guys that took 2-4 losses had at least one of those losses that could have been turned around with some improved wrestling consistency and position. That will be a major focus for us going forward." Next Meet: The Falcons will host the Falcon Duals next week on Saturday, Dec. 12. Note:Team went 7 and 3 with 2 pins. Note: Team went 0 and 5. Note:Team went 7 and 4 with 2 pins. Note: Note: Team went 7 and 7 with 3 pins. Note: Note: Team went 6 and 8 with 4 pins. Note: Team went 10 and 4 with 5 pins.